We don't have a sponsor for these two weeks and I am liking this.. I do love when there are sponsors but I have so many acrylic/rubber stamps and they are just sitting there being ignored because the sponsors are pretty much all digi's. So it's with great pleasure to be able to actually ink a stamp up.. 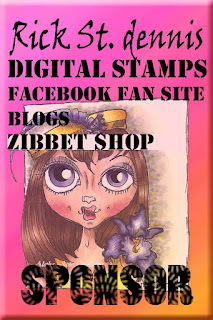 I am using Art Impressions rubber stamp images and sentiment. 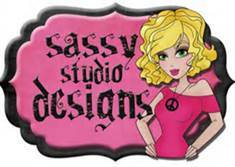 I laugh when I see their awesome images and quirky sentiments. You really cant see it but there are stickles all over the flames so it's quite sparkly ... I used my awesome ribbon again and added some small sequins and it's done. This card is a little bigger than my usual A2 cards. 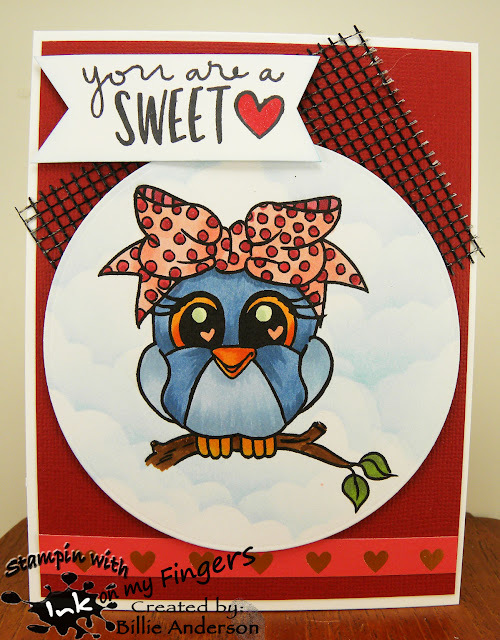 I like it but I will most likely give this to someone in person vs. mailing.. Oh I could make an envelope using the we are memory keeper envelope maker I have.. what a thought.. lol ... 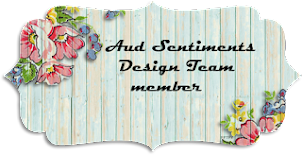 I hope you find time within the next couple of weeks to play along at Aud Sentiments for our birthday challenge. 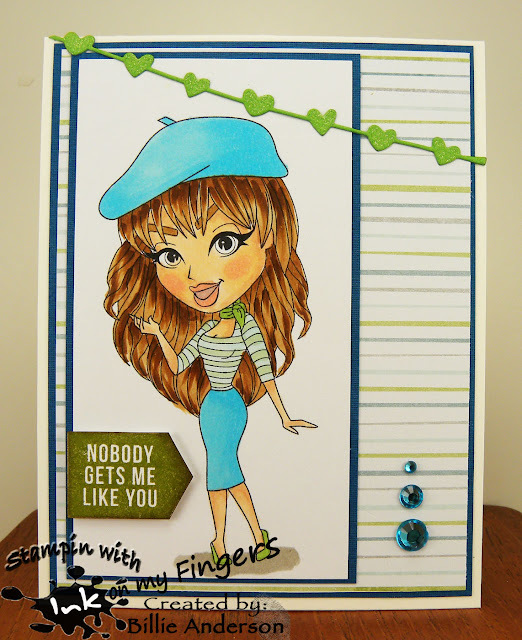 This is my card using the image called SHY.. I wonder what she is shy about.. she's sending hugs and kisses.. cant be too shy. 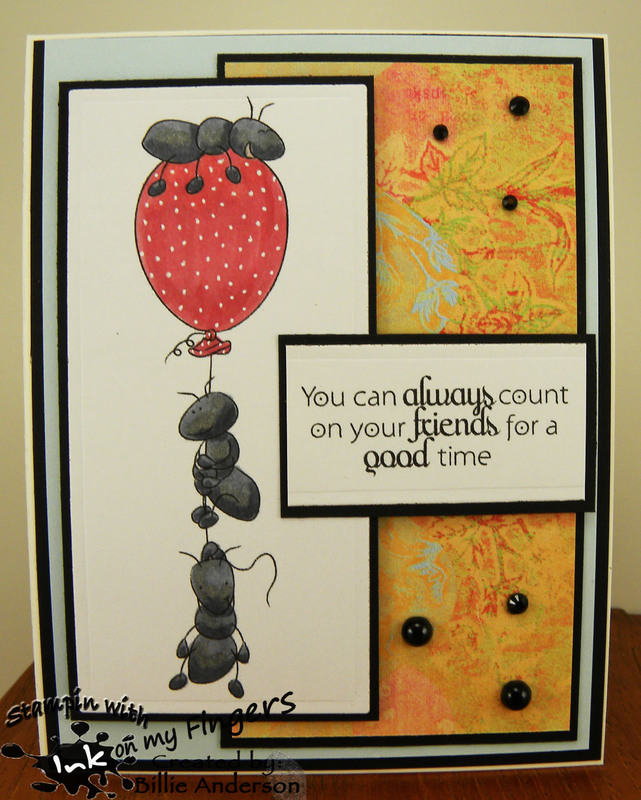 This card is made with some items that were just on my desk that did not work for other cards I thought might work.. I did not want to put away so used the chain of heart die and the note book die and of course the flowers and leaves which I always seem to have laying around. 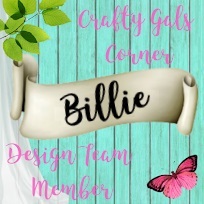 I hope you can use some scraps or what ever you have and make a card and enter over at Inspiration Destination for their ANYTHING GOES challenge.. that's pretty easy.. Also check out Cute as a button site for some of their cute images. OK WHERE DID MARCH GO????... I say one day closer to summer.. but wow the months are just whipping by.. 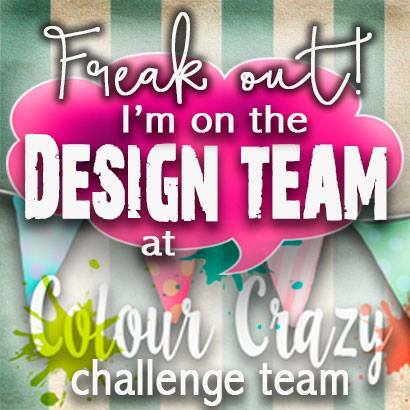 I hope you find time to play along at Inspiration Destination where it's always anything goes.. and check out Fresh Brewed designs for some cute images. 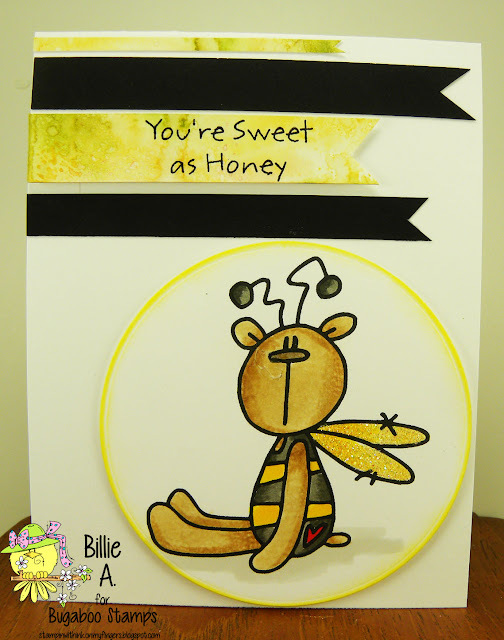 Catch the bug ABC - which is Anything But a Card project..
Ok you know I love Bugaboo and being on the Bugaboo/Catch the bug Design team you have seen a lot of the image.. This is one I chose to use for the Inspiration Destination challenge.. surprise...one I haven't used before.. This is Girl with kitty..cute huh?? 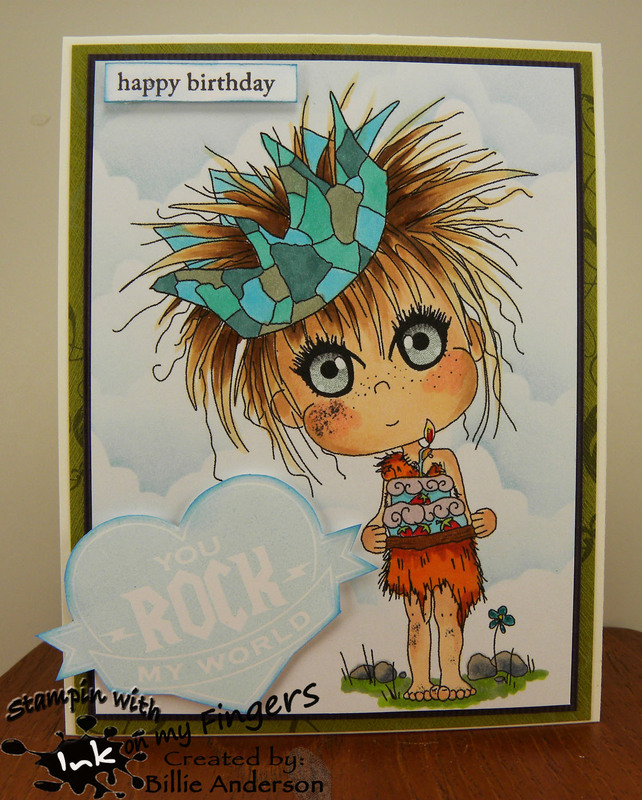 I hope you check out the images at Bugaboo and also play along at Inspiration Destination.. it's anything goes!! Jodie is taking a little break and she left us with this awesome image to play with. Keep an eye over at Catch the bug as we are still having challenges and specials. We are still keeping the fun happening over there. This is the new release.. It can be printed out quite big and obviously made smaller which is what I did.. 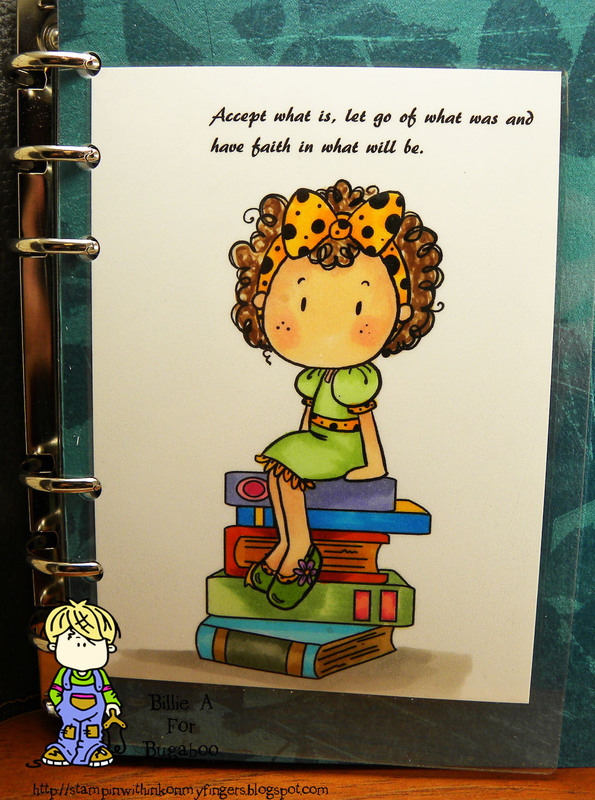 I wanted this to be a journal page it's about 5 X 6.5 and so I sat down and colored. It took some time as I am recovering from carpal tunnel surgery on the right and left hand. I would have to stop and relax, ice my hand and day or two later go back in and color more.. I plan to put it in the July section of my planner. 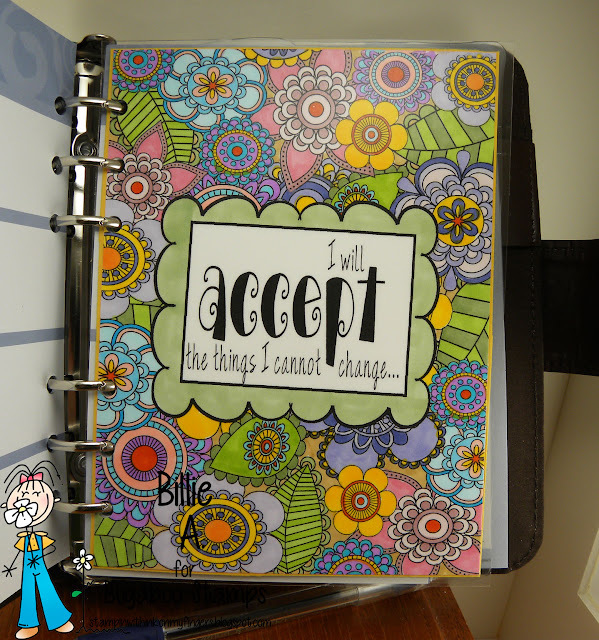 I think Jodie plans to do more of these color book type pages. This one also already had the sentiment on it but there is also a blank option. 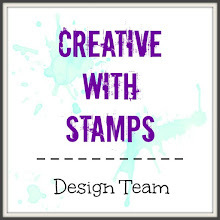 Just wanted to get the word out that I am on a new design team at Creative with Stamps. You have heard me talk about Monika Reeck (Creative with Monika).. well her friend Lilian (The leaf studio) started a new card challenge blog. 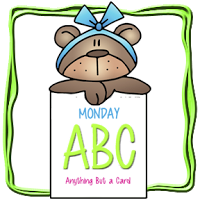 This is a brand new challenge blog (cards only) that will start April 1, 2016.. It will be for the whole month. The first of each month with a new theme each month. 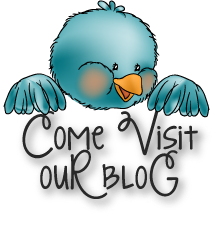 Grab the badge and get the word out on your blog if you'd please.. I sure hope you check out the challenge blog.. follow us and subscribe to us so you are on top of all that is happening. It's going to be a fun challenge blog.. I'm excited.. It's Friday so you know what that means at Bugaboo.. 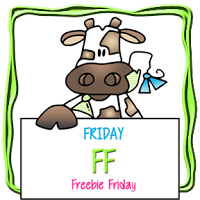 It's Free Friday and we have Bear Sitting image.. 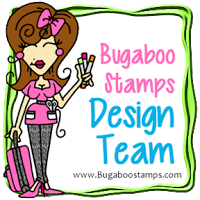 I hope you find time to head over to Bugaboo and get your free image. 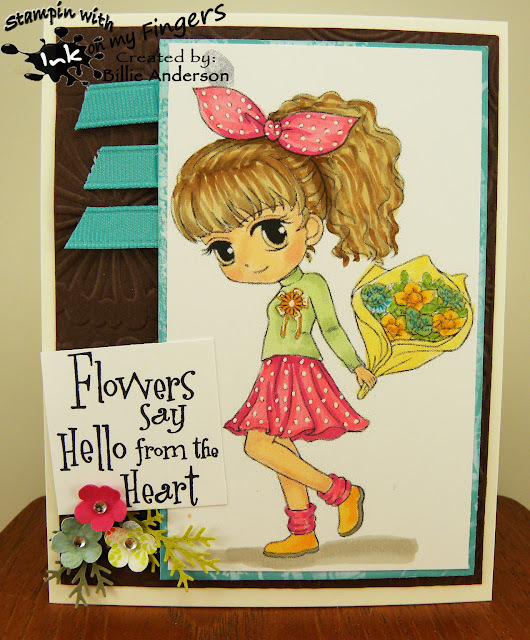 This is my card using Isabell's bouquet. I chose the row Ribbon / Flowers / Embossing. The embossing is the brown cardstock using cuttlebug embossing folder, the ribbon is out the side of the card and my flowers are at the bottom. Man I love those flowers. That stampin up punch with the three flowers was one of the best purchases I have made. It's great for scraps of paper just sitting down watching TV. and punch out all those "I can throw away scraps".. You know what I am talking about.. 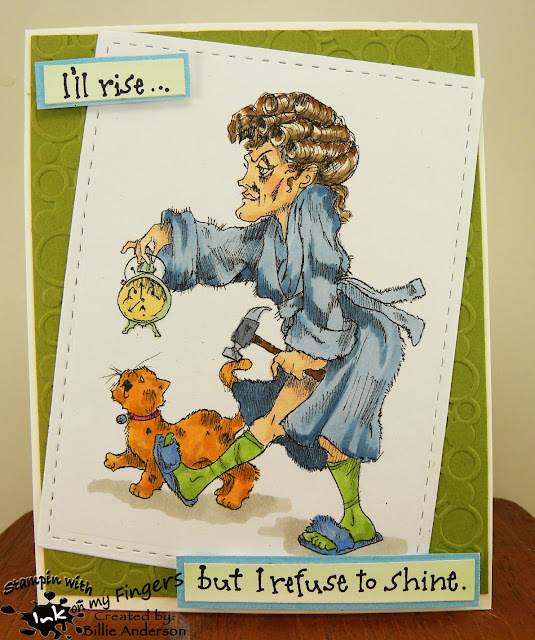 Anyhow I chose this darling image and I thought it would make a great Mother's day card since that is coming up soon. 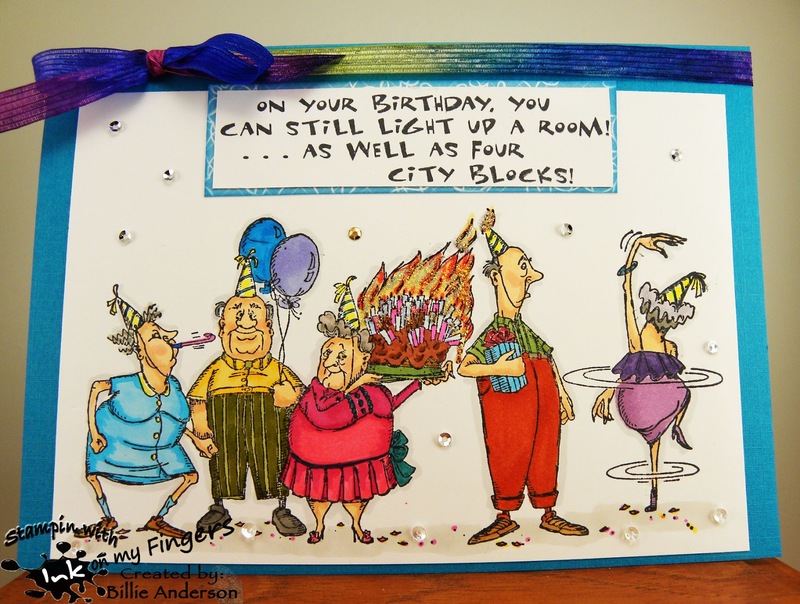 If not it's a great birthday card, friend card, anniversary card.. There are a lot of occasions that this can be used. I hope you find time to play along at Aud Sentiment and use the bingo card above and add the sentiment. Thanks for stopping by. I am in LOVE.. I love this little guy called Sticks and bones.. Look at him isn't he or she.. just darling.. I should of stamped the sentiment towards the bottom a little darker.. it says You ROCK my world.. I thought it went well with the image. I had a wonderful time coloring this image. I added my cloud template to the background. 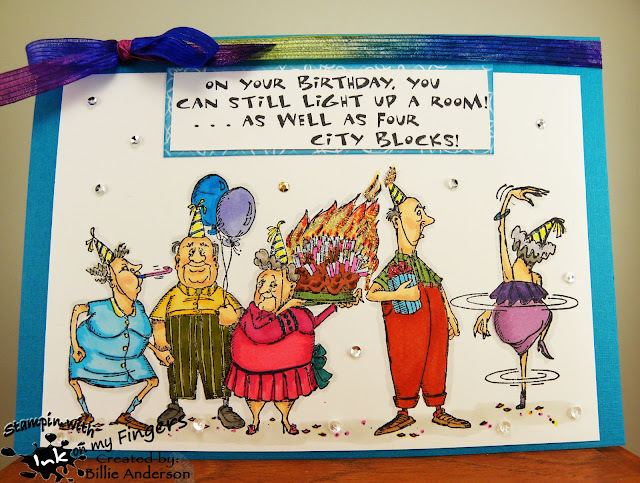 I hope you find time to play along at Inspiration Destination.. it's ALWAYS ANYTHING GOES..Check out the awesome images at Polkadoodles also. I am using the image called Adriana's Owl.. I know there are no blue owls.. but I decided to make it a blue bird.. I love the big bow on her head. I added a strip of designer paper with the hearts towards the bottom of the card and a piece of mesh behind the image. The sentiment is from Simon Says. I hope you can play along and join us at Inspiration Destination. I am using the new image and decided to make a birthday card.. 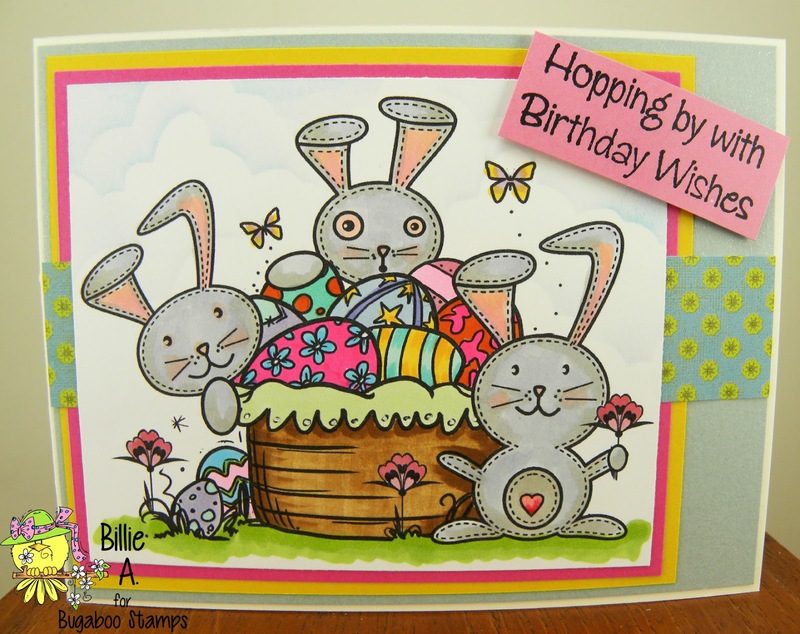 I know birthday cards are need all times of the year so thought this would be perfect for that Easter/Birthday loved one. I am loving the spring colors and so ready for spring and sunshine. Enough of the rain.. 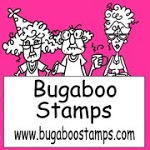 I hope you check out the Bugaboo store and see the great images Jodie has over there. 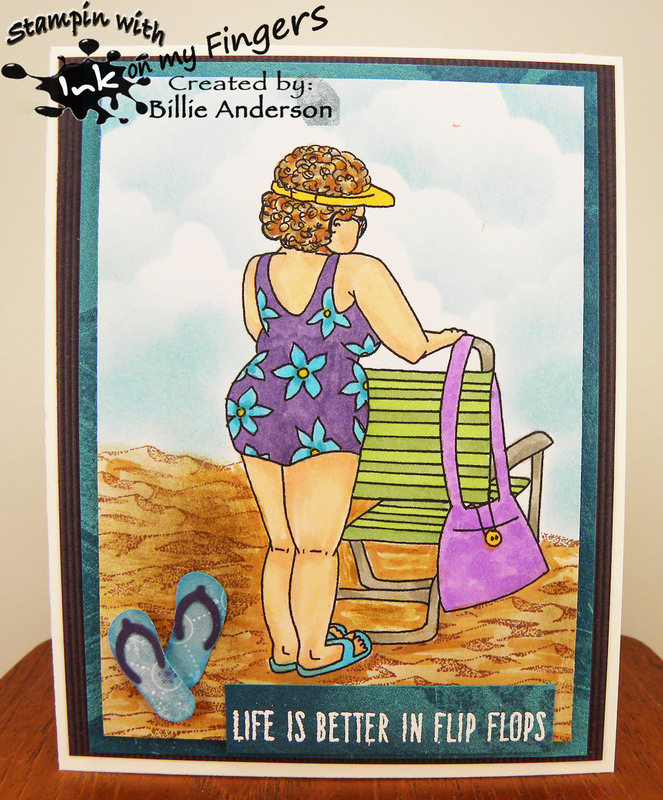 This is my card using the image called Petals.. I chose to use Spring theme for my card. The sentiment is spring sounding and I kept with some spring colors. 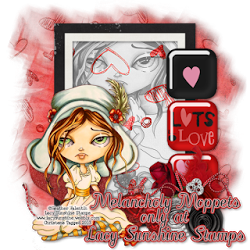 I love these darling images from Lacy Sunshine. 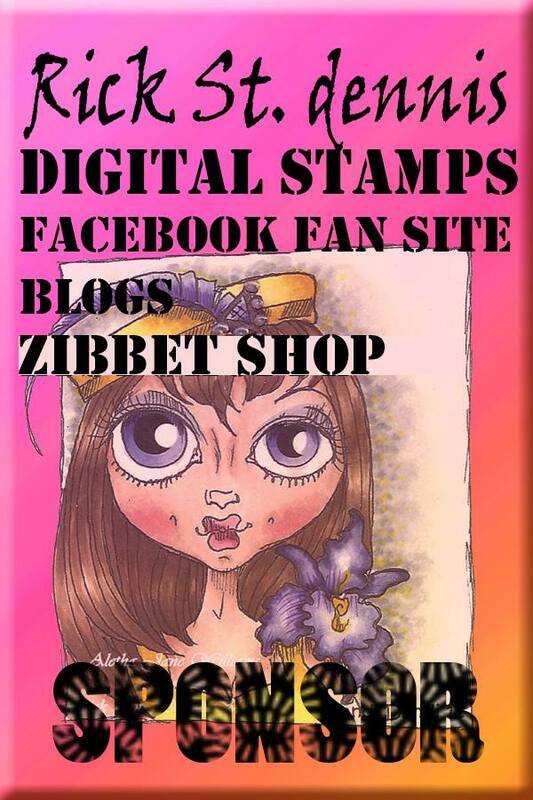 I hope you stop by her shop and check out her darling images and also the Aud Sentiment design team and their Lacy Sunshine creations. You have two weeks to play along and just have a Spring or Easter sentiment. I have this great sentiment from Art Impressions and I just had to use it with this great image. I love Rick St. dennis images. It was hard to choose which one to use but this one won I am glad I chose to use her... I hope you find time to play along and at Inspiration Destination.. and check out the awesome images at Rick St. dennis.